The Cold War Battles game system is a grand tactical simulation of battles that were fought—or could have been fought—during the Cold War. The playing pieces represent the actual units that participated or could have participated. Two games included in this issue are: BUDAPEST 1956, covering the ill-fated rebellion in the Hungarian capital in late 1956; and BLITZKRIEG ANGOLA, the clashes between Cuban and South African mechanized forces in Angola in 1987 and 1988. There are two players in each game. In BUDAPEST 1956 one player controls the Hungarian Rebels and possible NATO "what-if" reinforcements, the other controls the forces of the Warsaw Pact. 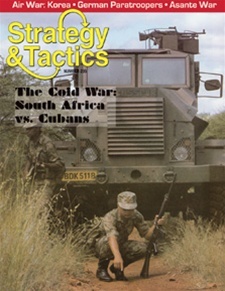 In BLITZKRIEG ANGOLA one player controls the South Africans and their UNITA allies, the other the Cuban and MPLA forces. In the Budapest game each hexagon on the map represents half a kilometer across, and each game turn represents one day. Soviet maneuver units are mostly battalions, with regiments for their artillery and assault guns; Hungarian rebel units are ad hoc groups; and NATO intervention, when playing that special alternative history scenario, are represented by US "Pentomic" battlegroups. In the Angola game each hexagon on the map represents eight kilometers across, while each turn represents anywhere from one week of intensive combat to four weeks of refitting. Units on both sides are mainly battalions or equivalent groups of irregulars. The game system is low-complexity (totaling about 13,000 words) and compares to the one used in last year's Middle East Battles: Suez '56 & El Arish '67. There are 280 NATO-style (with some iconic) half-inch counters. Playing time between two experienced opponents of roughly equal skill levels will be about three hours per game. Designed by Joseph Miranda.